Delivery from £10.00 to United Kingdom in 5 - 15 working days. Polly Inverse is a voluminous classic diffuser, large enough to be impressive without being overwhelming. 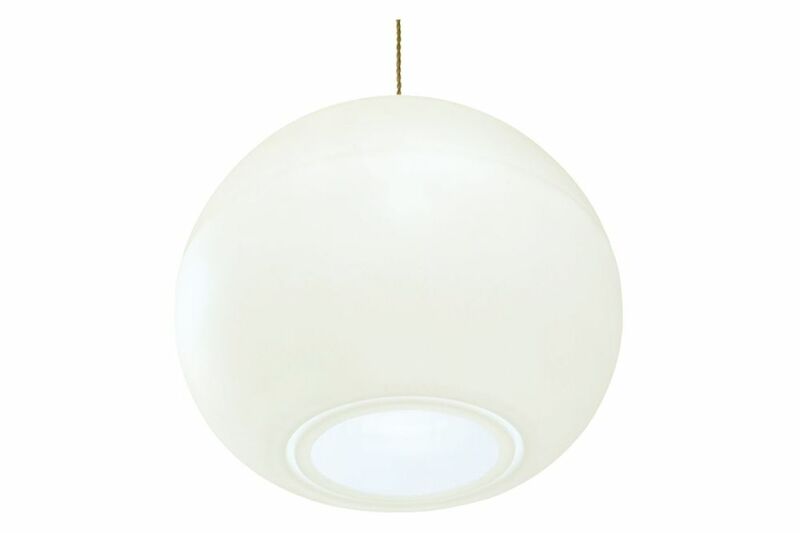 Polly Inverse has a weighty, early twentieth century quality, and can be used as a large central pendant in homes, or as a calm ball-shade in large open event spaces. Great in groups too, - three in a row in a dining room or a cascading cluster of 6 in a reception area look fantastic. The even, all over glow as well as more concentrated beam below means that there is an uplifting feeling of light bouncing up as well as useful light diffusing to horizontally and even especially down. One Foot Taller products are made in small factories and workshops in Scotland England and France. No wiring. OFT can supply pendant drops. If using existing: shade ringsand cord grips necessary. OFT recommends: Philips E14 ‘P45’. One Foot Taller is an award-winning lighting design and production company. We have been making elegant decorative lighting since 1995. The pieces combine elementary modern lines and utilitarian grace with the occasional drop of humour.